Today our family trip across the country took us across the prairielands of eastern Colorado and Kansas, and this drive reminded me of one of life's little truths: sometimes when the scenery does not change, nor does it provide great color and excitement, we feel like we ought to be able to skip this part. 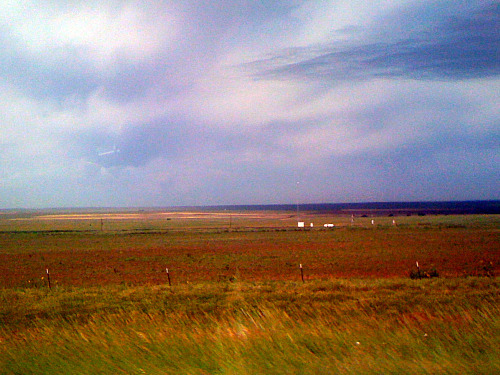 But if you are really going to drive from Denver, Colorado, to Lawrence, Kansas, you can't skip the Great Plains. You can't make the distance any shorter, nor can you change what's there: mile after mile of corn, hay, grasslands and cows. I was braced for more than 600 miles of "boring" driving, but after a while, my eyes began picking up on the more subtle changes in my surroundings. For example, the endless grassland is not all the same color, as it seems at first. Shades of green begin to emerge: the dark green of the corn, the bright green of the prairie grass, the blue-green of sage. Then there's the green-gone-brown of the hay and grain, not to mention the yellow wildflowers: black-eyed Susans, sunflowers and other sprays of yellow flowers I couldn't identify. When the land is flat, with only gentle rolls here and there, the sky becomes a theater and the clouds show their personalities: the fast-moving low clouds seem to hurry their way to some gathering, the rain clouds on the southern horizon spill their discontent in a sheet of gray, the cumulus clouds high overhead keep their lofty distance. Life is so hurried, and we rush to our destinations, discounting anything we think we know already. But there is so much we could be seeing! "Wilderness is the raw material out of which man has hammered the artifact called civilization. No living man will see again the long-grass prairie, where a sea of prairie flowers lapped at the stirrups of the pioneer..." -Aldo Leopold, "A Sand County Almanac"
Everyone should take the time to read this collection of essays, published posthumously in the year 1949, yet the words of which were (and in some ways still are) far ahead of the time. If you take the time and can really see what's there, Kansas is a beautiful state. Not THERE like the mountains of Colorado(Tchaikovsky). Or great vistas like the Atlantic and Pacific Oceans, (Grofe's Grand Canyon Suite as an example). Kansas is more Debussy, Impressionism. My wife, who is extremely familiar with the subtleties of Kansas, says look at the blue hills just West of Lawrence for a beautiful part of the country. Lawrence is also jam packed with history, especially around the Civil War. See Quantrill's Raiders. By the way, yes, you can ski Kansas. That's a beautiful photograph and a wonderful insight. Thanks, Laurie. Hey!!! You wish you could have skipped Kansas?!?!?! MEANIE!!! As you have shown, it is possible to make lemonade out of lemons. I would not drive across Kansas again. Reminds me too much of watching paint dry. Lori, You have captured a sentiment of mine that I was never able to put into words. I grew up in Colorado and often drove through Kansas. Something about it always cleared my mind in a way that I have not experienced since. Thanks.